Who in their right mind would have the audacity to do that? And also, that kinda looks photoshopped to me. Around the edges, there are some bits which aren’t quite pink, and are more white/gray. yeah true ben, but it could be they missed it with dye, there are some crazy people out there. looks shopped. notice how red it is around the mouth and eyes, and even in the ears, it’s as if they tried to blend, but FAILED HORRIBLY!! And Ben1605, your way off. I’ve circled the real white areas. if that thing is real, that’s just sick. and if it’s not, it’s so disturbing. IÃ¢â‚¬â„¢ve circled the real white areas. Those could just be wear the sun is sort of reflecting off it. I hardly think someone would miss that much if it was a photoshop. 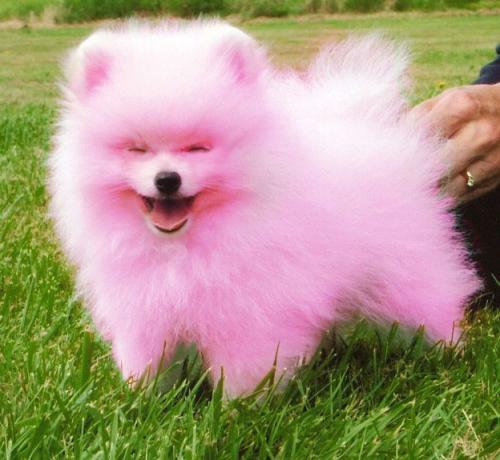 I’m betting they just brushed over the dog with pink, then changed the blending mode to colour. And since the dog was originally gray or white, the colour didn’t lay over that very well in parts, so it is only extremely slightly pink. They had to poke out this puppys eyes so it wouldn’t go for the throats of the people that did this to him.